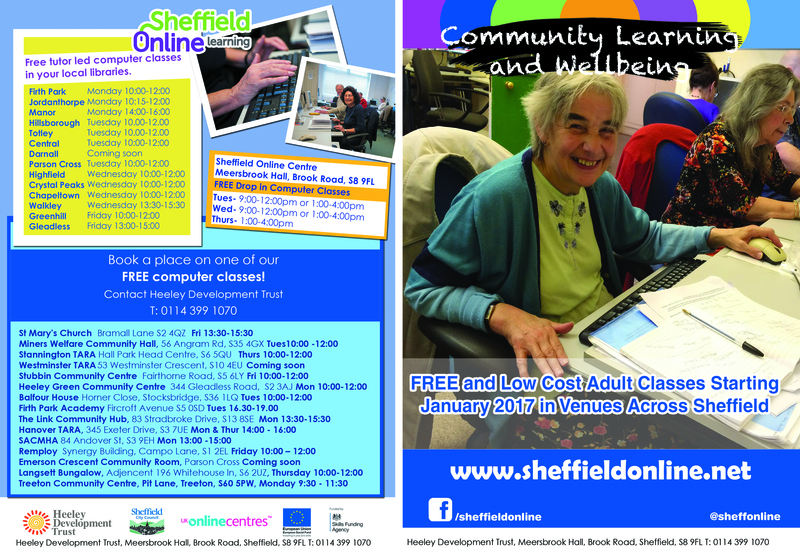 Across Sheffield there are a number of venues offering free drop-in computer classes. At these classes you can learn to use computers and other devices, from the very basics, to get you up to speed in the digital age. Don't worry if you have never used a computer before, our tutors are here to guide you through every step. Our ‘no jargon’ approach means that you don’t have to worry about learning technical terms and can get on with enjoying the benefits of being online, so why not join the hundreds of people who’ve come to us and found that it’s never too late to learn! A friendly, confidential service offering individual sessions for advice and CV writing help. If you live elsewhere in Sheffield, ring the same number to find out about sessions running near to where you live. Absolutely no previous knowledge of computers is required, and our ‘no jargon’ approach means that you don’t have to worry about learning technical terms and can get on with enjoying the benefits of being online, so why not join the hundreds of people who’ve come to us and found that it’s never too late to learn!